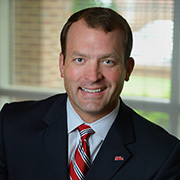 Ross Bjork was announced as the seventh full-time director of athletics at Ole Miss on March 21, 2012. At age 40, he arrived in Oxford as the youngest AD among Bowl Championship Series (BCS) schools and came off a successful stint in that post at Western Kentucky University. Bjork set the tone early in his Ole Miss tenure, hiring one of the country’s top rising coaches in his sport in Brian O’Neal (track and field) in just his second month on the job. Under his direction, exciting things are happening around Ole Miss Athletics, including first-year head football coach Hugh Freeze guiding the Rebels to a bowl game for the first time in three years and the Rebels reclaiming the Egg Bowl trophy. Bjork also appointed three executive-level administrators for external relations, academic support and facilities/game operations. The external relations post was a new umbrella position at the center of Bjork’s reorganization of that area of Ole Miss Athletics, including the UMAA Foundation, ticket operations, marketing and communications, and the relationship with Ole Miss Sports Properties. He also created the unit for Health and Sports Performance, which combines sports medicine, strength and conditioning, nutrition and counseling services, and added a local orthopedic sports medicine component that will provide primary sports medicine care for all student-athletes. With his guidance, upgrades are under way for the Indoor Practice Facility. New projects include a full-service dining facility, football team meeting room, player lounge and visuals throughout the complex. Bjork also launched a major sales campaign for football season tickets, which included television and radio advertising, billboards, Internet marketing and a new outbound telemarketing call center. The youngest athletics director of the 120 NCAA Football Bowl Subdivision (FBS) programs when hired at WKU, Bjork has an extensive career in intercollegiate athletics with two decades of experience as an administrator and student-athlete, having worked on the senior staffs at UCLA, the University of Miami and the University of Missouri. He began his administrative career at WKU as an assistant development coordinator in 1996-97. At WKU, Bjork spent time with all head coaches to evaluate and understand the necessary ingredients for each sport to reach its maximum potential athletically and academically. After he made a midseason coaching change, the Hilltopper men’s basketball team went on to capture the 2012 Sun Belt Conference Tournament title and advanced to the second round of the NCAA Tournament. WKU’s football program posted the greatest one-season improvement in conference wins in the history of the Sun Belt in posting a 7-1 league mark and second-place conference finish. Bjork is a native of Dodge City, Kan., and received his bachelor’s degree in recreation administration from Emporia State University in 1995, where he was a two-year starter at fullback. He earned a master’s degree in athletic administration from Western Illinois University in December 1996. Bjork is past president of the National Association of Athletic Development Directors. He and his wife, Sonya, have two boys: Payton and Paxton.